I remember watching Ray Bradbury. According to him, all he had to do was look around the room at his collection. This inspired him to write. So inspiration is really very personal. Nature is full of inspiration for me. Walking along a beach and finding beautiful multi-color pebbles smoothed by the sea. I am attracted to beads that look just like that. Sea glass, also known as mermaid tears. This is ordinary glass that the sea has transformed into extraordinary shapes and smooth textures. I had made a necklace in gold with sea glass I collected years ago. I had to melt it, I needed the money for my business. When you love what you do, you have to make sacrifices too. Flowers with their intensity of color. Inspiration is there. All you have to do is look. 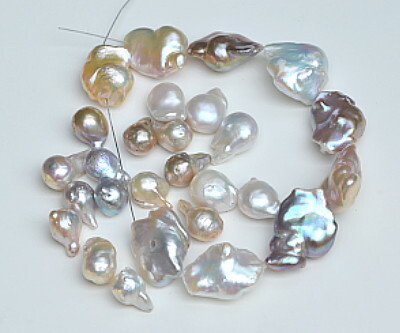 Another example: you can buy Triple A quality beads. The best color and pretty flawless. Lesser quality can even be more beautiful. Matrix has been left in the stone. The color is more opaque. Beautiful! I tend to buy beads that inspire me. I do have a weakness for carved beads. Be adventurous. There is nothing to lose. You can always take your piece apart and use the beads for something else. I can tell you there are times when inspiration has taken a walk….without me. 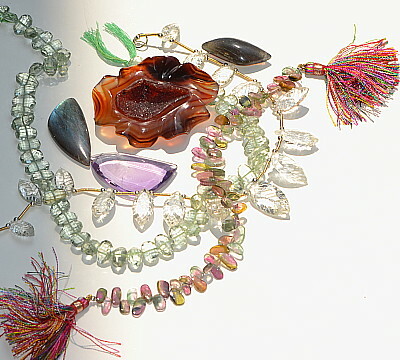 I have taken out so many strands of beads, there’s no room left on my work table to make anything. I call this Beader’s Block. Best thing I do is put everything away and forget it. I’ve learned not to force the issue. Inspiration needs a vacation too and it does come back. I could go on and on…but I have brain fog. I am used to being inspired without any thoughts. Writing about this is having to think. If you are trying beading for the first time, know that what you make is an extension of yourself. After all, you are the one creating. Start with you. Like most people we are creatures of habit. Take a good look at the colors you pick to wear. The style you tend to gravitate to. Chances are you will pick beads in the same colors you wear. Your jewelry will have your sense of style…Like myself, I tend to be quirky, elegant, old hippie, and my jewelry shows it. It’s all good. Just for fun, next time you go into a clothing store, pick out colors you have never been attracted to before. If you plan on selling your work, you must learn to use all colors. Not everyone is just like you or me. Diversity is key. I have told you a few things. If this helps finding your inspiration, I have helped. omg i have been having a “beader’s block” for a while now and this post really got my mind going with soooo many different ideas already. thanks so much for this post. i LOVE it!